I had labs this morning. I always dread this, no more so than when I'm sitting there waiting. Usually I have something to mentally psyche myself up with. Some sin to atone for. Accepting adjunct pain for the sake of meditation. Whatever. But today there was nothing. Whether any of that's good psychically or not in the long run, it comes in handy when they're drawing blood. I started thinking about bin Laden being killed, since it was just announced last night. How much worse it'd be to have someone shoot you in the face, I thought. Yet waiting for the needle, at least it's antiseptic, and you've got a nurse who does it everyday, and people usually survive. 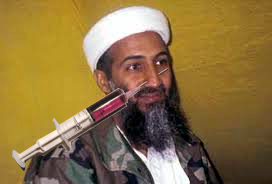 I heard the guy before me talking about bin Laden with the nurse. I was trying not to listen, but there was no avoiding it. I needed some alone time. Then the nurse called me to the chair, and didn't say anything about bin Laden. I didn't want to excite her in any way. The radio was playing Kelly Clarkson's "Behind These Hazel Eyes," but it was just coming to the end when the needle went in. Next came on the local announcers laughing it up about bin Laden and giving the "Top 5 Reasons to Celebrate Bin Laden's Death." The last thing I needed was some local guys' attempts at humor. The needle was in, and it was painful today, and I would've much preferred another song. But, no, it was The Morning Crew with their idiotic yuks. The Top 5 Reasons weren't actually funny. They've had 10 years to write the list and this is the best they could do? It was weighing on my mind. My face was grimacing. Still, I was actually glad it wasn't funny, since I didn't want the nurse to start convulsing the laughter, not with the needle still in.